Red Wine and High Heels: When life has you accidentally buy a crap load of lemons.. When life has you accidentally buy a crap load of lemons.. I have been scouring my favorite food blogs and cookbooks looking for new, healthy and tasty recipes. 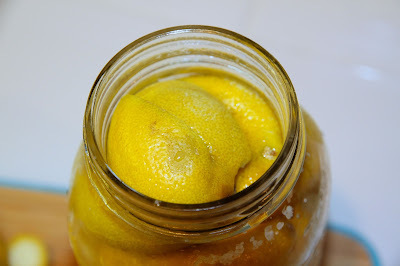 While searching I came across a few recipes that use preserved lemons and while I like trying new things, I don't necessarily like to pay big prices for things I can make much cheaper on my own. So when I realized that I had purchased waaaay to many lemons last week (every time I left the house I bought some for no good reason! ), I remembered that I wanted to make a few of those dishes that called for preserved lemons and really how hard can it be to make these? Well turns out it's not hard at all, it just takes about 30 days. Which I can totally wait for because one dish will require me to either learn to debone a chicken or beg the butcher to do it for me (I will definitely let you know how that one turns out!). I looked at several different ways of doing this and ended up keeping it simple and pure, using just salt, lemons and lemon juice. I combined a few of the recipes into what you see below as I couldn't find one that I liked 100%. I can't wait to try these in a month. It goes without saying, but as the preserved lemon rinds are what you use once they are done, make sure that you wash the lemons well, using a fruit and veggie spray if you are a stickler like me. 1. 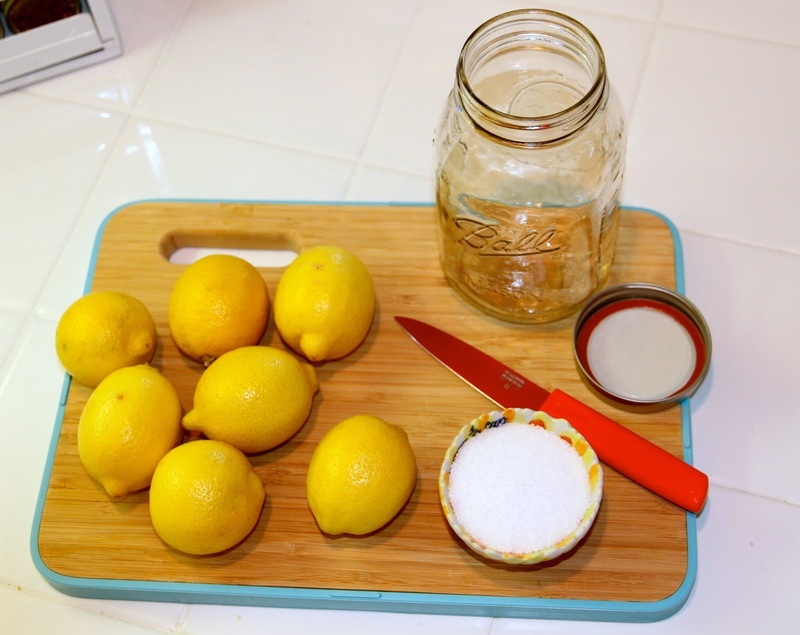 Sprinkle a tablespoon of salt in the jar to get started. 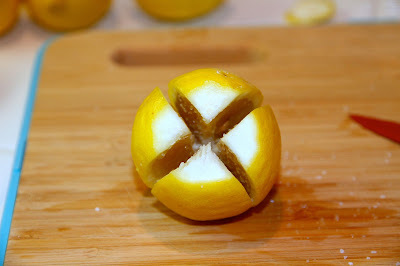 Quarter your lemons starting from the top and stopping within a half inch or so of the bottom so the lemon remains whole. Sprinkle the inside of the lemon generously with salt, reshape and place inside the jar. Continue the process with the remainder of your lemons being sure to salt between the layers of lemons and making sure to press down on the lemons inside the jar. This not only makes room, but releases the juice to help cover the lemons. 3. Place the jar in a warm place where they can ripen, making sure to shake the jar each day to keep things working properly, for 30 days. 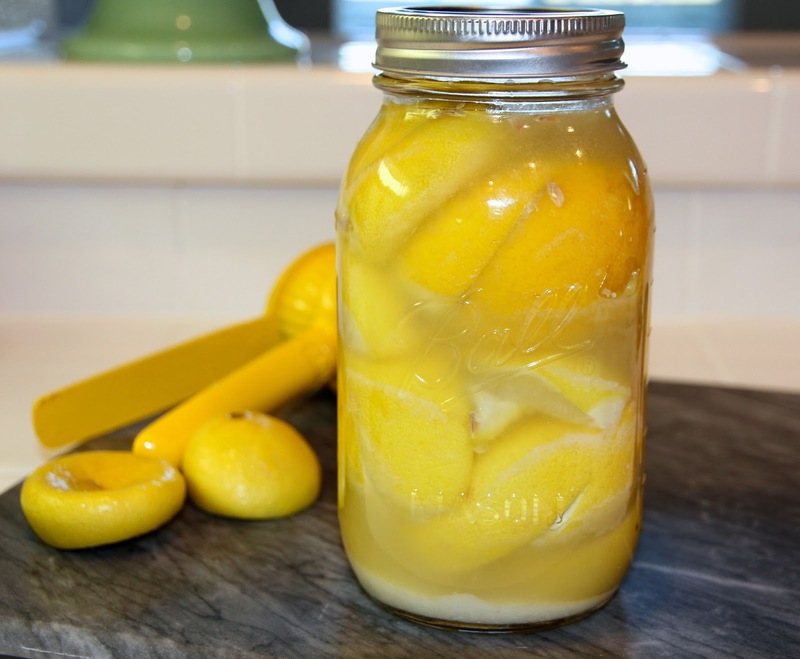 Once you are ready to use, rinse the lemon under water and if you prefer you can remove and discard the pulp. 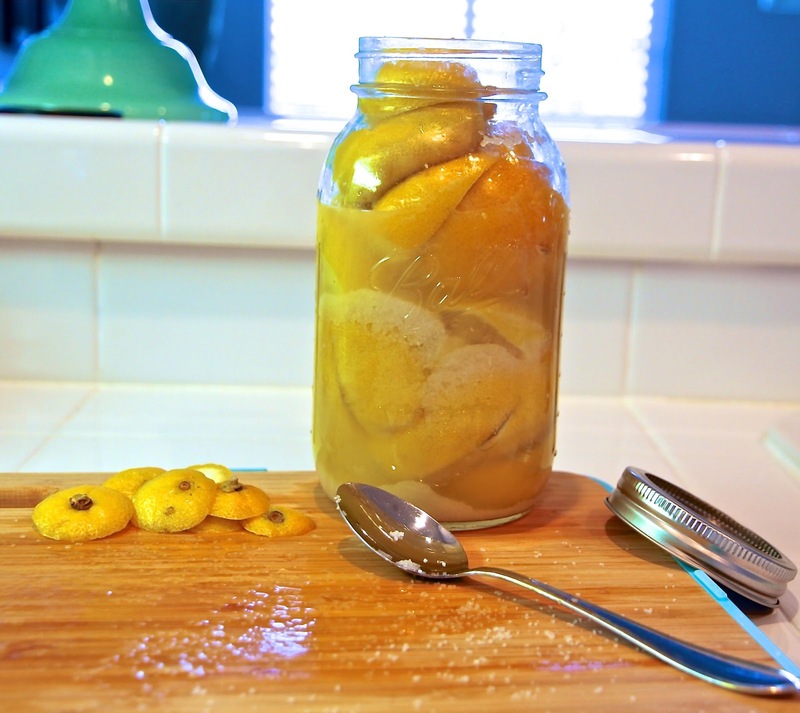 Everything I have read says that these are good for up to a year and you can reuse the pickling juice two to three more times if desired. Not sure how I feel about that last bit, but we will see how it all works out.